Why do children do what they do? What's on their minds? How can parents know their child's inner world? Do you ever wonder why your child behaves the way she does? How many times in a single day do you ask yourself, "Why did she do that?" Even little things can throw you. Your three-year-old lies about putting her toys away in the bin. She lied? At age three? Sometimes it's surprising, but unsettling nonetheless. For example, your teenage son oddly trips over a stool in the kitchen and blurts out as he's getting up off the floor that he wants to meet a certain girl at a party, something he'd usually keep to himself. Why does he tell you now? Does he just feel like confiding in you or did something happen that he's not quite ready to tell you yet? Parental Intelligence helps parents become "meaning-makers" who understand the significance behind their kids' behaviors. Kids' actions are communications. A parent has to take up the up the challenge of deciphering the message. This is a life changer for a mother or a father, a new perspective on infant, child, and teen behavior. With five enlightening steps, parents can solve problems by learning what their kids think, want, intend, and feel. Faced with puzzling behavior? How can you decide what to do about a behavior if you don't understand it? Before asking, "What do I do?" ask, "What does it mean?" Parental Intelligence helps parents as they wrestle with the common and sometimes desperate vexations of family life. It's time for parents to view distressing infant, child, and teen behaviors as catalysts for change by transforming them into open exchanges of ideas and feelings. Parents and professionals alike can find a new empathic approach that will reshape families' lives and guide them through all stages of typical and atypical child development. 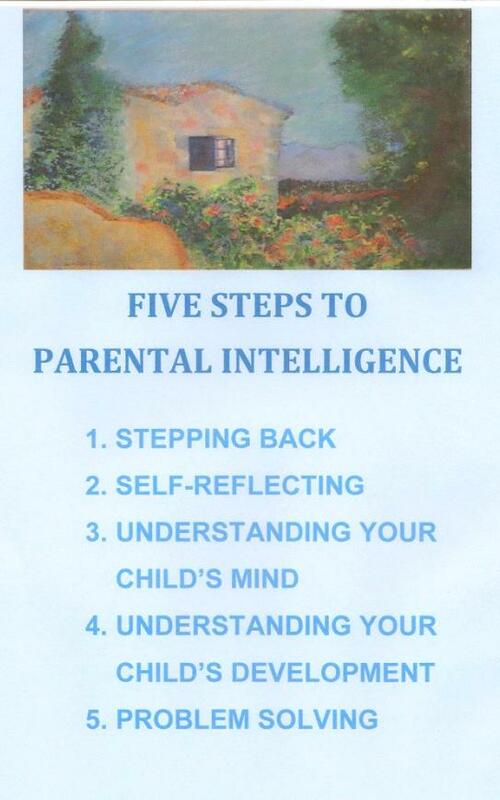 The first step in Parental intelligence is called Stepping Back. This means not reacting quickly in the moment. At first this seems counter-intuitive because parents are frequently taught to react immediately with powerful consequences that teach important lessons. Discipline is misinterpreted as providing punishments instead of carrying out the real hallmark of discipline: learning. Stepping Back is like the old adage - think before you act. Who can argue with that? Let's say you yell at your three-year-old for lying about putting her toys in the bin as you told her and respond by insisting she sit in the corner for a few minutes. She gets scared and listens, head down. The punishment leads to fear because your tone of voice is threatening. She doesn't learn not to lie. She only learns to fear being yelled at. Instead, Stepping Back requires slowing down the process when you face misbehavior. Pausing, thinking through what just happened is a new response to unwanted behavior such as lying. It gives you time to think if your child has done this before. Searching for patterns in recurrent behaviors often leads to surprising revelations. When older kids lie, for example, this becomes especially important. The second step is Self-Reflecting. Notice your reaction to the misbehavior as a way to learn more about yourself and your child. Are you angry, disappointed, surprised, confused? Does the behavior remind you of something in your past life that has nothing to do with your child? For instance, do you remember endless arguments about not listening to your parents who told you to clean your room? Ghosts from the past start resurfacing letting you relive the way your parents reacted. Maybe yelling was very common in your house growing up -a way you promised yourself you wouldn't repeat and here you are unwittingly responding similarly to a three-year-old about her toys. The third step is Understanding Your Child's Mind. This is the all important crucial game changing step for parents. Children act in unwanted ways when they don't find their words suffice. Our challenge is to find out what they are actually thinking , feeling, and intending. They generally already know what is right and wrong, so something else is going on. Once they've seen you've stepped back and are calm, they are often calmer, too. If you ask what they've been bothered about and promise not to judge or criticize (and stick to that), you may be surprised by the flood of words, tears, and complaints. The tough part is listening without interruption and even asking for more because you genuinely want to understand out of love and care. Let's say you ask your child, "Why didn't you put the blocks in the bin?" She says, "I was still playing." Then presto, she puts them right in! Oops! She didn't need to lie. She needed a little autonomy, a big step for her at three. It was an opportunity to make her own decision about the timing of the job to be done. She had her own thoughts and wishes and was ready to express them, given the chance. How sad to think of her wanting to make an independent decision and ending up in a corner fearing her mother's tone of voice, which was probably why she lied in the first place. This child is lucky because Parental Intelligence is used from the time she is very young. As she grows older, when this is done regularly as part of your parenting life with her, you may learn in more complicated examples that there is an undercurrent of worries, fears, struggles, or other kinds of troubles that get blown into other misbehaviors. If, however, you look to understand what's going on in her mind, you have the chance to discover the real problems that lie beneath the behavior. Misbehavior amazingly becomes a catalyst to communication! This strengthens your parent-child relationship. Step four ranges from vital to precautionary: Understanding Your Child's Development. Make sure you aren't expecting behavior that your children aren't capable of yet and reprimanding them for something they aren't able to accomplish. Kids have strengths and weaknesses regardless of what the books say is appropriate for a certain age. Your child is an individual. Each child needs a different manual that says what's expected for that child at their age. Think back to the teenager who tells you about the party. Maybe he's gotten in trouble drinking at parties before and wants to finally confess his problem with alcohol. He's outgoing and capable of thinking of the consequences to his health and social life and wants to talk about it but is afraid you'll only be mad if he tells you what's been going on. On the other hand, maybe, he's a quiet child with Asperger Syndrome who has never liked a girl before. He may not be ready to socially engage with this girl and pick up on her social cues. Maybe he's afraid he'll be made fun of and rejected. The kind of talk you will have with him is entirely different. There are social skills and ways to engage a girl in conversation that he may not be aware of. What you may need to understand with each teen is clearly so different. Step Five, Problem Solving, comes naturally after the other steps. Once you learn the overarching problems, like the three-year-old wanting some autonomy over his playtime or the teenager wanting to confess his alcoholism. You collaborate with your child, even the little ones, about how to go about finding solutions. Your parenting style is reshaped into seeing behavior as a route to understanding the mind of your now grateful, trusting child. After thirty years of experience as a psychoanalyst and therapist with families whose lives have changed due to Parental Intelligence and living with my two sons who were raised this way, it's a rewarding way to be a parent. We've all had those times of feeling so helpless and self-doubting as a parent. This way of life changes that. When you unlock your Parental Intelligence, you don't need to have absolute answers because parenting becomes a process with your child who knows you will be on his side no matter what. There's much less push-back even from teens because they know you're ready to listen with love and careful understanding. It takes time to establish this approach in your everyday life, but the gains are immense as you discover your kids apply critical thinking and show empathy on their own in everyday problems they face in their lives and even empathize with you when you need it! Laurie Hollman, Ph.D. is a psychoanalyst who specializes in infant-parent, child, adolescent, and adult psychotherapy. 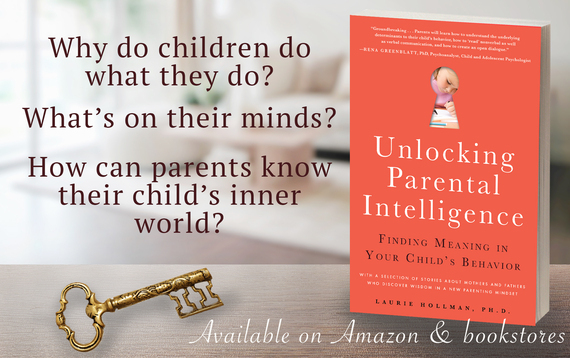 Her book, Unlocking Parental Intelligence: Finding Meaning in Your Child's Behavior, can be found on Amazon, Barnes & Noble, Familius and wherever books are sold.